Can we assume that since 4.5.0.90 is getting perilously close to 4.5.1 that this is going to be an official stable release very soon? Sorry, couldn't resist. If this isn't stable then we need to know about it. When we start hanging RC off a build then, yes, that means we believe it is close. For some reason there is no download available and it asks me to check order status. Anyone else having trouble with saved scenes opening with genesis being a stretched mess and completely unusable? It seems to be when using files saved in the old format, which presents a BIG problem for me unless there is some kind of work around. I have seen this one during a fairly early build of 4.5. I did it by applying a V4 pose to Genesis that changed the rotation order and broke the binding of the figure. This was done with a DUF save and load. It looked like Genesis turned to liquid, which looks similar to your image. That has been fixed. Without more information I can't be sure but what it looks like is you saved a .daz file in some version of DAZ Studio before RC1, which had genesis posed using a previous generation pose. Upon loading the .daz file the binding, like my pose, broke. There is a work around, though it is time consuming. Reinstall the old version of DS, save out character presets for your saved characters, (Note a character preset does not carry the pose.) then you can apply those presets to Genesis in the current version and quickly recreate your scene as poses will not break the binding anymore. It seemed to happen to all genesis models I used, although I cannot recall if any/all have been subjected to a pose from an older generation. I seem to have found a work around in saving the characters as character files as well as the scenes. Not 100% on this but so far it seems to work. Daz Studio 4.5? I like it. I was afraid to put it on my main machines.....but the tests I've run are really impressive. I think I'm going to put 4.5 on one of my "working" machines which have more horsepower. I do miss Reality...but I expect to see that coming along in time. The AutoFit works better for me. I'll be testing Dynamics and aniMate since these are the plug-ins I use the most. I plan to go over and get the Creation Engineer by Midnight Stories. Still getting the red and blue block artifacts when rendering with shadow maps. Was really hoping those were going to be addressed. Any suggestions? @WayftheSword: the last group of digits is simply a number of days so it can go above 100. At the same time .92 has been marked as Pending Release so it's probably about to be finalised (see here: http://docs.daz3d.com/doku.php/public/software/dazstudio/4/change_log#pending_release). Merri: reduce your scene to minimal size (presumably: hair, camera and lights), file a bug report at bugs.daz3d.com, and attach your scene. It uses different credentials from the forum and account, so you need to create a bug-tracker account. I've just been itching to get Reality2, but saw that Reality2.5 won't be released until DS4.5 is finalized. And now that I've started saving files as .duf s, it would be a pain to go back for reality, just to switch back. I have one file which will not open in RC3 (I hadn't tried this in RC1 or 2) but still opens in DS3 fine. In RC3 it gets to 20% and hangs the laptop every time. When I open in DS3 the only thing I can see that could be causing it is Optitex's Free Dynamic Apron, (which is no longer draped on Michael 4 as it was). I have yet to try removing the apron and saving to see if that opens, will do that later. Can anyone else replicate this to see if it is a bug? or just something funny with this file. I have had an Optitex dynamic cloth clog the saved file before; when I removed its scene data from the relevant /data directory, I was able to rescue everything else I needed in that scene. *phew* However, this happened in 4.0. *something, not in 4.5. Good to know it isn't just me - I hadn't opened this file in DS4.0. I can't think of any other *.daz files I have with a saved Dynamic in it, but I'll check. I suppose should try saving a Dynamic in RC3 and seeing if that has problems opening too... Come to think of it I did save a scene with Michael 5/Philip and Benjamin and the Dynamic flag in DS4.0, and that opened fine in RC2 last time. I have honestly no idea. In my case, it probably was because I had tried to use the dynamic cloth EXTREMELY wrong way and saved and that was it. Yes I've had that happen on 4 or 5 old files so far. A couple caused the entire computer to lock up, forcing me to reboot. The others simply caused RC3 to spontaniously shut down, kicking me back to the desktop. In response to the other poster who mentioned Dynamic Cloth, there was NO Dynamic cloth objects in any of my files. So that was not causing the problems in my case. I'd been going through my old files, both DS2 & 3 versions, saving new copies in the DUF format, when this started happening. Hopefully the next release, will fix this. My system is 3g Intel Quad Core Extreme(not overclocked), with 8 gig ram. Running Win 7, 64 bit, with sp1 and all latest updates. Unfortunately, there seems to be a bug with the installers produced by the version of BitRock InstallBuilder used to build the previous installers, which causes the uninstaller that is created by the installer to be invalid (0 bytes). When the new installer attempts to run the uninstaller created by the previous installer, it fails - which also causes the new installer to fail and the message that you are seeing to be displayed. Luckily, in this scenario the number/names of files in the new installer are the same... so to work around the issue, you can go to the path indicated by the dialog (in your case: "C:\Program Files\DAZ 3D\DAZStudio4\Uninstallers\") and delete the uninstaller (in your case: "Remove-DAZStudio4_Win64.exe"), which should have a size of 0 bytes if it is the same issue we've become aware of. You should then be able to run the new installer without it failing and it should create a new uninstaller that isn't 0 bytes. ... so we are aware of the issue and we want it fixed too - as much as, if not more than, you do. I did your instructions and all is working perfectly!! Just updated last night. Is there any way to save a preset material as the old format? If I understand correctly the new .duf extension will not open in order DAZ software. File>Save as>Deprecated>Materials preset (or wahtever you wish to use). Make sure you choose .dsa as the format - the others are tagged with th version they were saved from and won't work in older versions. When I make a texture to share, can I save as both the .duf and .dsa in the same folder so people get both file types or would that not be a good idea? You could do that, though I'm not sure you'd need both - if you did, it might make things easier for users if they were in separate subfolders since each user would presumably want to skip over one set of files. It would also confuse anyone with "show file extensions" switched off — they'd probably see two of everything, apparently exactly the same, and might think everything had just gone horribly worng. Collecting the different file types in different folders, or specifying in the file name which is which, would IMHO be better. 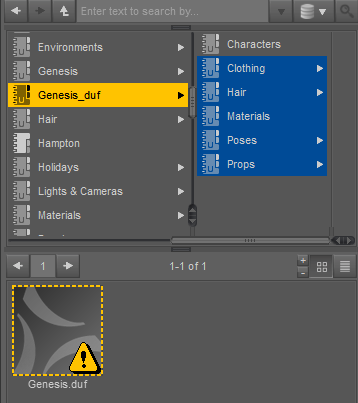 All of my new content files, such as genesis.duf, show up in Categories with a yellow triangle containing an exclamation mark on the thumbs. Also, almost every old file (DAZ and other) throws a Duplicate ID error. Is this possibly due to the capitalization? Excerpt from log: Sorry, can't attach by text file or by cut and paste into this. Duplicate IDs are a flaw in old content showing up in DS4.5 - I have a script to fix DSF files (see list of free scripts in sig), and most store content that suffers the issue has been updated. It has nothing to do with the directory structure. The yellow warning triangle usually means file not found - do the items show their thumbnails, or just a generic DAZ icon? Richard, I understand that I have to update my purchases or use the scripts. But for the content that came with RC3? Did you install the content to a different location this time? The database may still point to the old location, from which the files were uninstalled when installing the new version (though I thought the system had been fixed to use relative paths now). I've only installed 4.5 RC 3 once. I uninstalled 4.0X before installing 4.5. It installed under Studio and I moved it under My Library. That's your problem then - moving content (outside of DS) breaks the smart content. If you reinstall DS, making sure you select teh right location for the content, that should fix it. You could also try reimporting metadata from Content Library option menu>Content DB Maintenance. I seldom use Smart Content. I love my categories more. Surprise, surprise! I ran "scan known directories" from the Content Library tab and all the 4.5 thumbnails are fine now and it's all working. I'll try your suggestion for the Smart Content though. In DS4 the categories work from the CMS, as well Smart Content. For me, the smart content shows up in the 32bit Daz Studio, but only the stuff that came with Daz shows up in the 64bit version.